We Drink Your Milkshake! 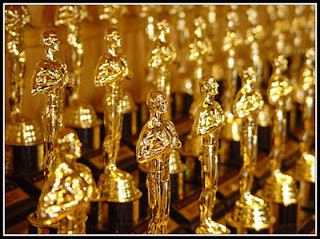 : 84th Annual Oscar Nominations Are In And THE ARTIST Isn't Nominated For Everything (But The Academy Still Snubs Good Movies)! Javi: If anything, my personal fascination with the Oscars is seeing how "safe"(that is still giving love to Oscar baits) they play it, and yet The Academy wants/tries to appeal to the mainstream audience with movies they might have heard of. What's funny is that when I talk to people that think COWBOYS AND ALIENS was a good movie, they tell me that most of the time they never pay attention to the Oscars. With that being said, just like money does not equal popularity, the Oscars don't mean always mean quality since they are mired by politics. The nominations are both surprising and, for the most part, very safe. It's a very conflicting stance, not caring while at the same time wanting to root for your favorite movie. I for one am very excited for the inclusion of HUGO in just about every other category. But not much else. The thing with the Oscars is that people are only interested as long as THEIR movies are the ones that are winning. Already on the Internet you hear of Michael Fassbender and Ryan Gosling snobs, and I say lighten up dudes because most REAL movie fans don't care for these awards. Think about how THE SOCIAL NETWORK, BLACK SWAN, and other movies that actually became more culturally prominent instead of last year's winner THE KING'S SPEECH. That's one of the reasons why I have gone from disdain to apathy. I'll probably be drunkenly live-tweeting this nonsense, mostly because it's tradition at this point. Apart from, that I won't be caring too much. Jonesy: I would love to say that I was shocked at some of the nominees this year, but really, I wasn't. Looking at the movies themselves, most are the typical, boring films that the Academy loves. I could rant and rave at all the nominations I think are ridiculous or the snubs (nothing for 50/50 or MARTHA MARCY MAY MARLENE? Okay I'm finished), but instead I'll focus on the ones that I am thoroughly joyed are there. First, I'm thrilled the Academy cut the Pixar cord because really was no coherent reason for CARS 2 to come anywhere near this list. Even though I haven't seen TINKER TAILOR, the simple fact that Gary Oldman is nominated is enough for me. He's one of the best character actors working that does not get the love he deserves. And I'm with my cohort in that I'm thrilled HUGO is leading the batch with 11 nominations. And the final hell yeah from the nominations was for a foreign language film, BULLHEAD. Now, it's not so much the film that merits excitement (because I haven't seen it, so I don't have an opinion yet), but the distribution studio behind it, Drafthouse Films. Drafthouse Films is an arm of The Alamo Drafthouse, a wonderful movie theatre that we love based out of Austin. Even though the studio is less than two years old, they already seem to have a knack for finding hidden gems already. Though my favorite part of the ceremony the past couple years has been reading my twitter feed and the snarky comments from fellow bloggers. Israel, FOOTNOTE, Joseph Cedar, Director. THE TSUNAMI AND THE CHERRY BLOSSOM, Lucy Walker and Kira Carstensen. The Oscars will be airing Sunday, February 26th 7P EST/ 4 P.